The woman whose body parts were found scattered around two Bronx parks in recent days had rushed out of her house last week, telling family members she had to go help a friend in danger, according to relatives, as police announced the arrests of two suspects in the killing. Lisa Marie Velasquez, 25, ran out of her Melrose apartment on Aug. 21, her last words to her family ominous. "The last thing my mother remembers is her coming and grabbing her bag, and being in a rush saying that she had to go help a friend who was in danger, and she ran out of the house," said her aunt, Jacqueline Perez. Police had released a sketch of the woman after two bags of her body parts were initially found at Crotona Park last Thursday. Then on Tuesday, police found two more bags of human remains believed to be linked to Velasquez, this time at Barretto Point Park in Hunts Point, about three miles from Crotona Park. Authorities Wednesday identified the body parts as those of Velasquez. The medical examiner determined she died of blows to the head, which caused skull fractures, in a homicide. Law enforcement sources said the head blows were from a hammer. Two feet and two hands were found in separate bags at one park, while unspecified remains were found at the other location. "The way she was tortured, for Christ's sake, she didn't deserve that," said the distraught Perez. "Who in their right minds would do something like this?" "She's my niece... she didn't deserve this." Police said late Wednesday they've arrested two people in the case: 31-year-old Daquan Wheeler of the Bronx has been charged with murder, manslaughter, concealment of a human corpse, tampering with physical evidence and criminal possession of a weapon. 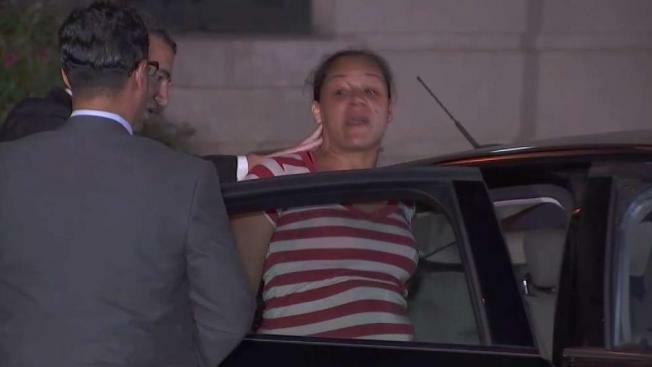 A second suspect, 30-year-old Ciara Martinez, has been charged with murder, manslaughter, concealment of a human corpse, tampering with physical evidence and criminal possession of a weapon. She was heard saying "She was my friend, I loved her" as she was being led out of an NYPD station house in the Bronx. Information on their lawyers wasn't immediately available. Wheeler and Martinez were boyfriend and girlfriend and Martinez was a friend of Velasquez, according to police, who added she is the one Velasquez went to go help the night she was last seen alive. This is the second grisly tragedy for the victim's family in just over a decade: in 2006, Velasquez's mother was murdered in front of her and her siblings. Police said the pregnant mother was beaten, stabbed and strangled by her on-again, off-again boyfriend, who was arrested in the killing. "In this lifetime, I never thought we would go through this again," said Perez. "This is the second episode... the type of animal that would do something like this to a human being," she said.